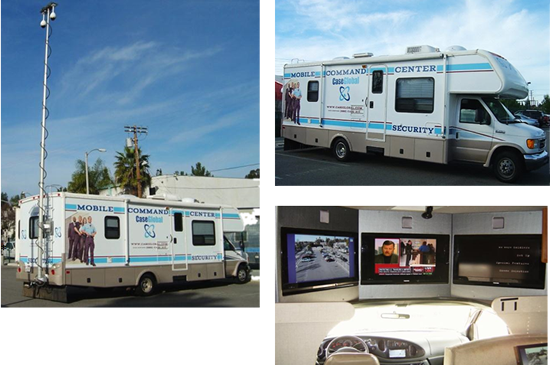 The need for an on-site Mobile-Command-Center is especially important for special events and emergency situations. This state-of-the-art nerve center can disseminate and relay communications to any position inside or outside the trailer, to a centralized location or corporate office around the world. Every event, large or small has people and equipment that need to be protected. With CASE Global Mobile-Command-Center and PSC deploying our highly professional and experienced guards would be the first and only step you need. This command center is equipped with a telescoping mast for closed-circuit video surveillance. It also features a satellite dish, internet access, 37 inch monitors for television local news reports, weather and external cameras. The external cameras include fixed and rotating PTZ to shoot any type of footage needed during an emergency or disaster. They also utilize IP wireless cameras for surveillance in the field; complete exterior lighting for night work. In addition, work stations are built into the side of the rig as it expands to enable more personnel to work inside the unit.